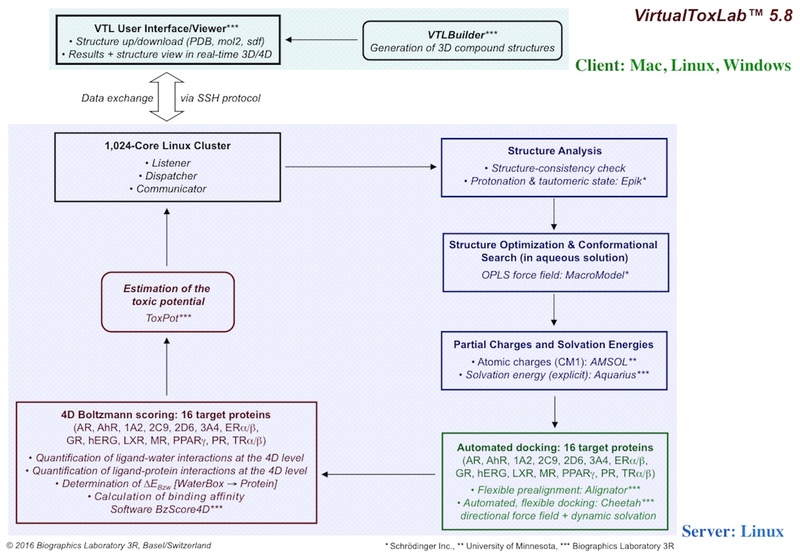 The VirtualToxLab is an in silico tool for predicting the toxic potential (endocrine and metabolic disruption, some aspects of carcinogenicity and cardiotoxicity) of drugs, chemicals and natural products. It simulates and quantifies their interactions towards a series of proteins known to trigger adverse effects using automated, flexible docking combined with multi-dimensional QSAR (mQSAR). Currently, the VirtualToxLab comprises 16 models of proteins known or suspected to trigger adverse effects: the androgen, aryl hydrocarbon, estrogen α, estrogen β, glucocorticoid, hERG, liver X, mineralocorticoid, progesterone, thyroid α, thyroid β and peroxisome proliferator-activated receptor γ as well as the enzymes CYP450 1A2, 2C9, 2D6 and 3A4. 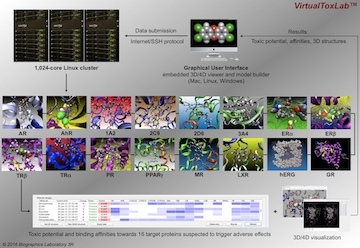 Most important, the VirtualToxLab allows to rationalize a prediction at the molecular level by analyzing the binding mode of the tested compound towards all 16 target proteins in real-time 3D/4D. The distribution comprises a graphical-user interface (including a 3D/4D viewer and a 3D model builder). The VirtualToxLab runs in client–server mode and the interface supports Macintosh, Linux and Windows operating systems. As of today, we have tested over 2,500 different compounds — drugs, chemicals, natural compounds — with respect to their affinity towards the 16 target proteins (AR, AhR, CYP1A2, CYP2C9, CYP2D6, CYP3A4, ERα, ERβ, GR, hERG, LXR, MR, PPARγ, PR, TRα, TRβ) and estimated their toxic potential. The results are shown here. The VirtualToxLab contributes to two aspects of the 3R philosophy: First, it allows for an early recognition of potentially harmful substances, thus, replacing stressful animal tests in preclinical research and development as compounds with a significant activity towards any of the database surrogates are not cleared for further studies — including pharmacological and toxicological testing. Second, a widely used database of this kind would reduce the number of otherwise doubly-conducted (toxicity) tests at research laboratories focussed on identical or closely related biomedical targets. The OpenVirtualToxLab is free of charge and thought for Universities, governmental agencies, regulatory bodies, public hospitals and non-profit organizations with moderate need of the technology. 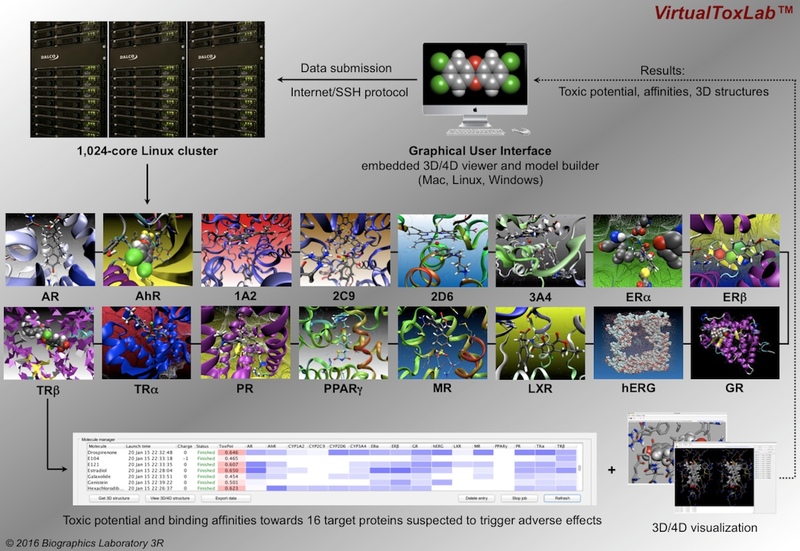 Except for the rights to download the 3D coordinates of the ligand–protein complexes (PDB format), the OpenVirtualToxLab and the VirtualToxLab are identical.